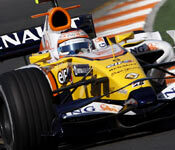 The ING Renault F1 Team concluded its opening winter test session today at the Circuit de Catalunya near Barcelona. The team continued working with the R28 as Nelson Piquet completed his third day of work this week. The team’s programme saw further continuation of slick tyre evaluation and R&D work with an R28 that was set up to simulate 2009 settings. Nelson had a trouble-free day and completed a total of 94 laps to round off a positive test for the team. The ING Renault F1 Team will be back in action from the 9th to the 11th of December to resume its winter testing programme in Jerez.